Welcome to the OnlineBingo.eu community! If you´re new to this all-time classic game, no worries – with the following guide, you’ll be a pro in no time, enjoying our great selection of 75 ball or 90 ball games, friendly chat rooms, juicy jackpots and fantastic promotions! 1. Pick an Alias and Avatar! Bingo is above all a social game, so chose an alias and a profile picture to display to your fellow players in the Chat room – make sure they’re as awesome as you are! To update your alias and profile picture, simply contact our Support Team. Alternatively, you can also update your alias with our Chat Hosts. 2. Choose your Bingo room! Once in our Bingo tab, you´ll have a wide selection of Bingo rooms – so how to choose The One? Easy: Are you feeling like a 75 or a 90 ball game? (We explain the difference further down!) You may also check the number of players currently in the room, the current jackpot amount, the price of the ticket, if there is a Chat Host (check for the CM icon) or the remaining time to the next game. Additionally, you can check the Bingo Schedule here. 90 ball bingo is the traditional game most played in European Bingo communities—in fact it is also referred as British Bingo. The 90 ball Bingo ticket consists of 3 lines of 5 numbers (from 1 to 90), totaling 15 numbers per ticket. 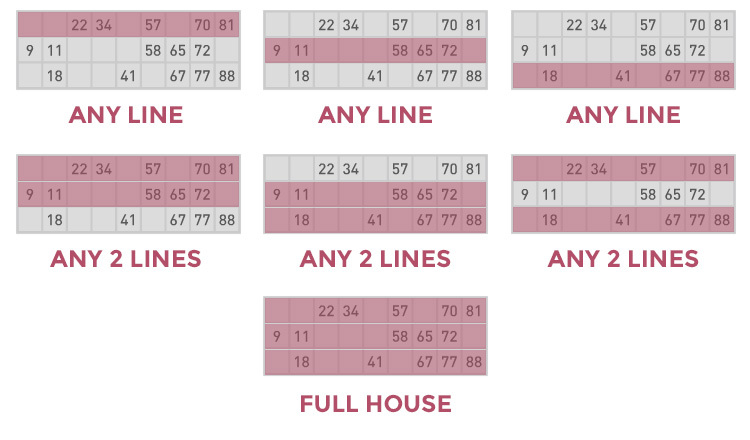 You can buy individual tickets, though our stripes consist of 6 tickets. You win by marking off all numbers of either line 1, 2, 3 or all three together (full house) in each round. 75 ball Bingo, also known as American Bingo, is the most popular version in the United States. 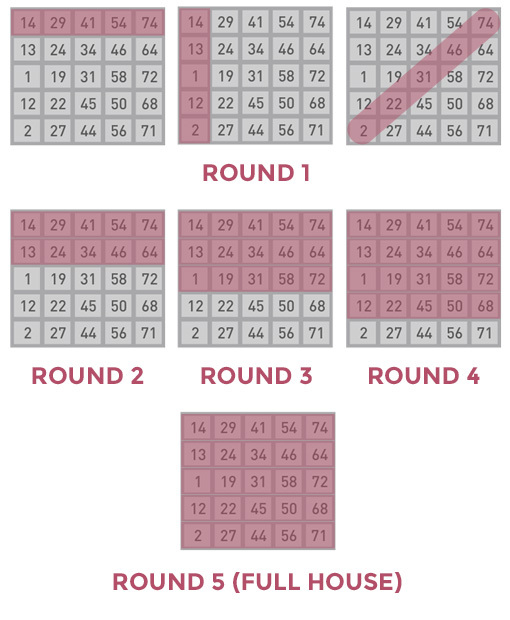 The 75 ball Bingo ticket is a 5×5 grid of numbers (from 1 to 75) with each column named after the letters B, I, N, G and O. Our stripes consist of 3 tickets. You will purchase full stripes and not by the ticket like in the 90 ball games. You win by marking off all numbers of any horizontal, vertical or diagonal line in Round 1. In Round 2, the winning pattern changes to 2 full horizontal lines. In Round 3, it becomes three horizontal lines, followed by four horizontal lines for Round 4, and finally five horizontal lines for Round 5 (full house). 3. Let the games begin! Once in the Bingo room of your choosing, select the number of tickets / stripes, or select the stripes by clicking directly on them, and confirm your purchase with the “Purchase Cards” button. Our software will automatically mark off the numbers called, show the winning patterns, let you know how far you are from a Bingo and announce the winner(s)! Your OnlineBingo balance will be automatically deducted from your purchases and credited with your winnings. Eyes on the Prize! Prizes are proportional to the number of cards purchased and are won when you do a Bingo!, meaning that you completed one of the winning patterns. The information about the total of cards purchased, the prize contribution and amount can found in each individual room. Two progressive jackpots are also in play in each room: their value and current contribution is indicated in the Bingo room and you can win these jackpots by doing a Bingo! in a specific range of calls. Join our friendly Chat! Bingo is a social game and we highly encourage you to log into the Chat while you´re playing – Be nice and make new Bingo friends! Our Chat Hosts or Moderators are also present in the Chat rooms when you see the corresponding “CH” icon from the lobby. They write in upper case pink letters so that you can identify them easily, and they are here to help and entertain you throughout your games! Pre-purchase: In this section, you´ll be able to purchase a specific amount of cards for a specific number of games. Keep in mind that if you leave the room before the start of the game, these pre-ordered cards will be canceled and your balance won´t be deducted. Side Games: You may let our software do the Bingo for you, while enjoying Slot games!